Photographer Eric Fischer has mapping in his blood. 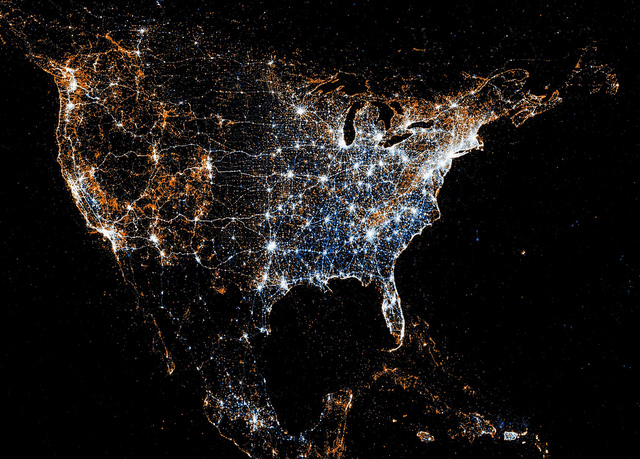 Having previously created maps that only used Flickr geotags and charted racial segregation in the top 40 cities in the United States, Fischer has created a stunning set of maps that chart the locations (geotags) attached to every tweet and Flickr photo. The maps provide different insights into how both services have been adopted but also what locations are most popular from a photography perspective. Flickr data is shown in orange and Twitter data is displayed in blue (Click the images for bigger versions). You can see the other countries he has mapped by visiting Fischer’s Flickr page. It seems the number of Twitter users geotagging their tweets is still very low, whereas the rise in smartphone use has helped assist a boom in photo location tagging. Despite this, it still makes for a very beautiful set of images.